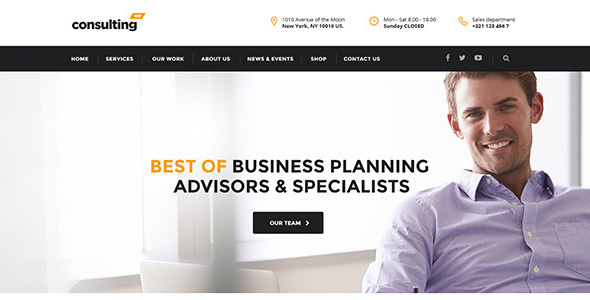 Consulting WP is a premium corporate, finance, consulting and broker WordPress theme, tailored to your needs and the expectations of your clients. 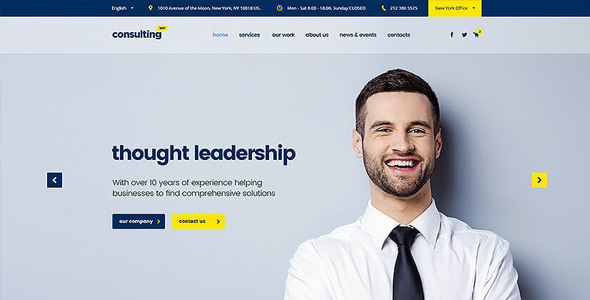 Download today The Best Consulting WordPress theme! Use custom Pie Charts, Graphs, and Progress Bars to present and describe your services or case studies to potential customers. 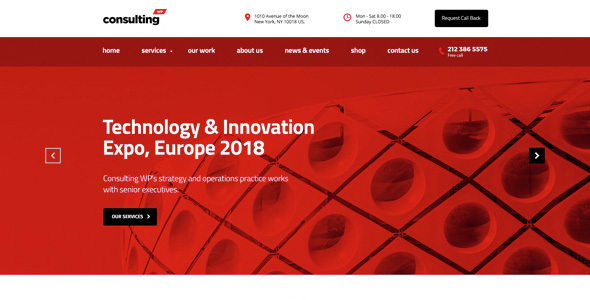 With Consulting WP – the Best Corporate WordPress theme – you can choose from unlimited modern, clean and professional color skins, and unlimited header layouts, to perfectly frame your content and suit your brand style. This business WordPress theme also includes the Revolution Slider, so that you can create stunning slides with animated effects in no time. The Visual Composer drag and drop page builder is fast and intuitive to use, making it easy to build and arrange page layouts, and the Theme Options panel in WordPress Customizer lets you edit your content in real time. It means that you can play around with the look and feel of your site with an instant preview before your changes go live. Now you’re ready to pack your Consulting WordPress theme with great content that will engage and inspire potential customers. Choose how you want to display your services and case studies, for maximum impact. A choice of templates, including custom pie charts, graphs and progress bars, gives you a range of dynamic and compelling options for showing your clients what you can do. Your consultant or advisor WordPress theme is fully responsive and retina ready, so you can be sure that every client will have an optimum experience of your content and services on any device. The clean and lean code means that it loads quickly too, so you won’t keep your clients waiting. 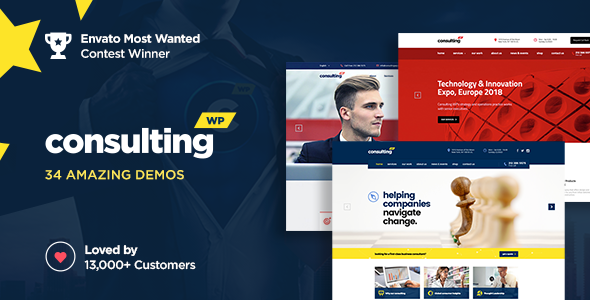 Consulting WP is a fully optimized WordPress theme, built with SEO in mind, so you can be confident that you will rank highly on search engines, and attract more visitors than ever before. This theme is built with Sass – the most stable and powerful professional grade CSS extension language – and is WPML and translation ready, so it has never been easier to share your content with international markets. We have also integrated Google Maps, including multi-location, so that potential customers, all over the world, can find you at a glance! 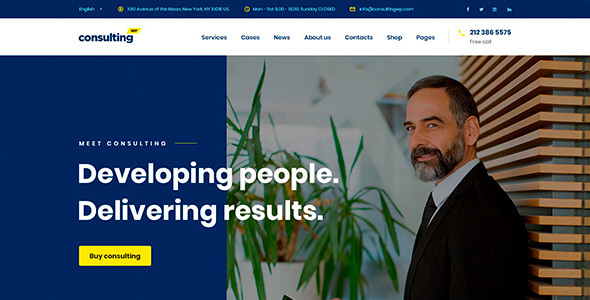 We want you to get the most out of your Consulting business WordPress theme, so we offer personal support and updates 100% free of charge: get in touch with us using our ticket system at www.stylemixthemes.com. With our one-click demo content install, you can get started right away! 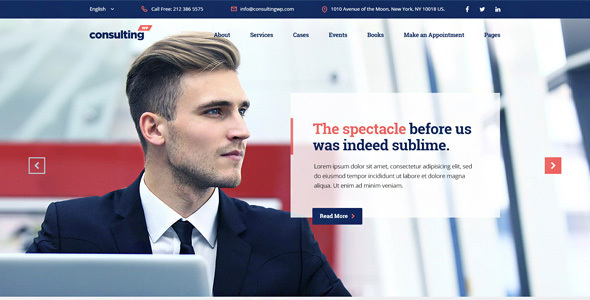 Get now The Best Business WordPress theme! AMP allows Consulting WP to be displayed fast and crispy on any mobile device. 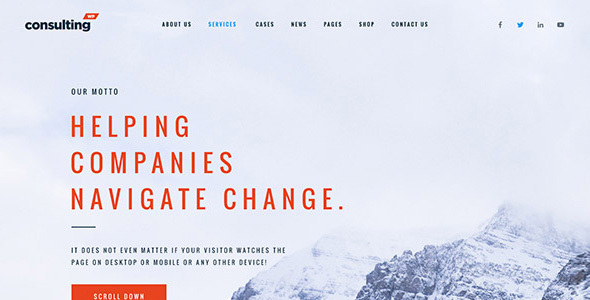 Consulting is AMP WordPress Theme. Consulting WP includes GDPR compliance plugin for managing user data, cookies, etc. Consulting WP looks great on any device, from mobile to desktop with retina optimized images and SVG icons. Change the look and feel of your site with the real-time preview WordPress customizer. See how your website looks before you push the changes live. Fast, intuitive and smart page builder will make your customizations fast and easy. Your custom layout will be ready for publishing in a minute! Notice: Images & Photos are not included in the theme package because of license restrictions.